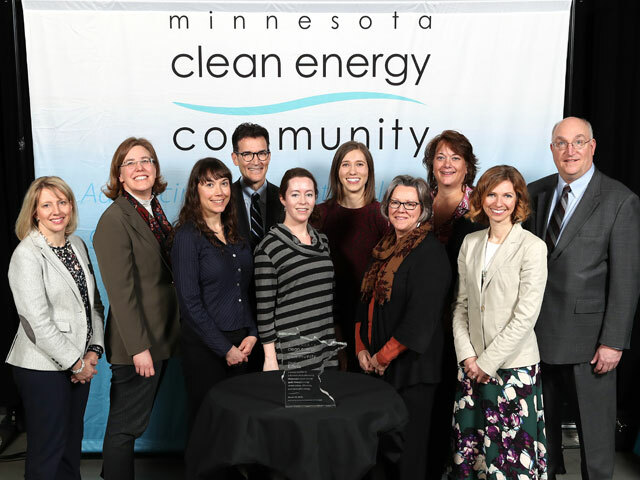 Seven Minnesota communities are recipients of the 2018 Clean Energy Community Awards coordinated by the Minnesota Department of Commerce and the Clean Energy Resource Teams (CERTs), with financial support from the U.S. Department of Energy. 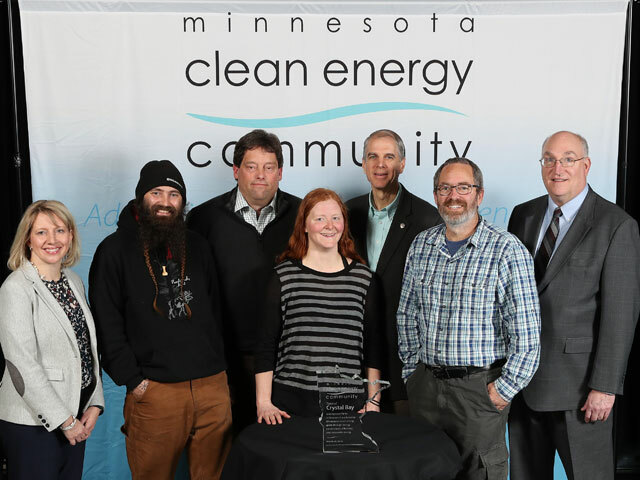 The awards were presented March 28, 2018 at the CERTs Community Driven Clean Energy Conference in St. Cloud. 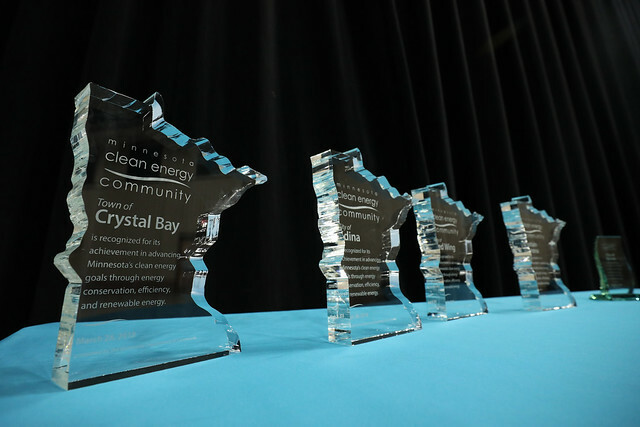 This year’s awards honor community-organized clean energy initiatives in the Town of Crystal Bay, City of Edina, Hennepin County, Minnesota State University Mankato, City of Red Wing, City of Warren, and Sustain Winona. 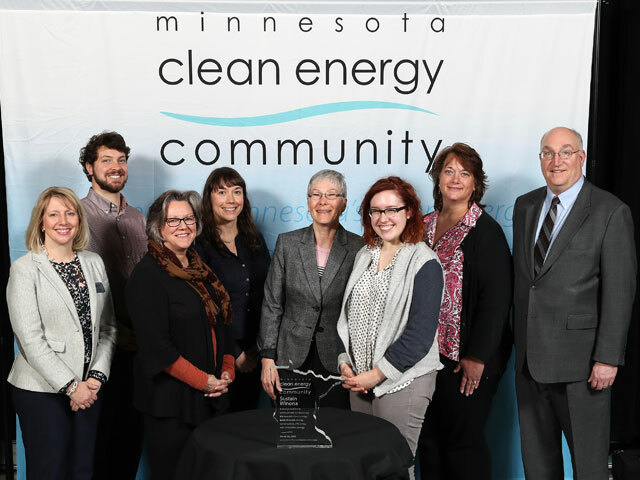 These communities are contributing to the state’s clean energy goals with programs, policies and technologies that encourage energy efficiency, conservation and renewable energy generation. 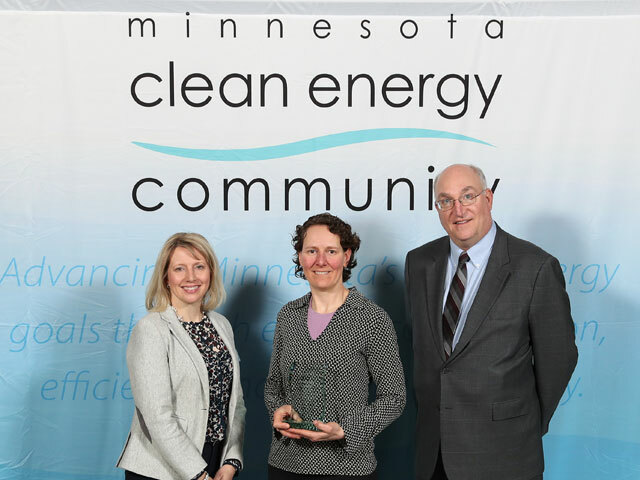 Elizabeth Dunbar, energy and environment reporter for Minnesota Public Radio, emceed the awards ceremony. 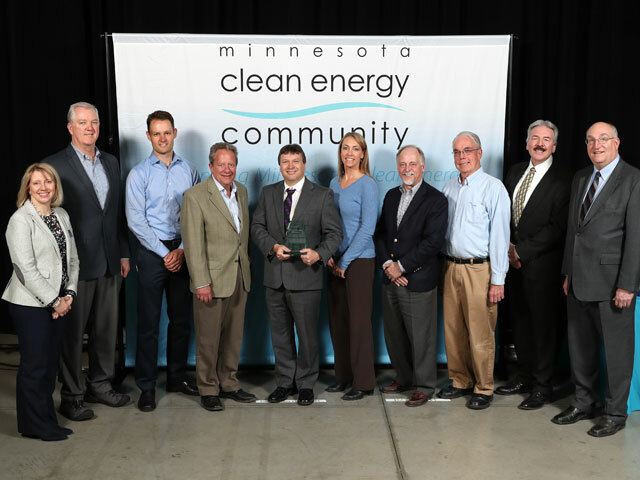 Awards were presented by Commissioner Looman and Bill Grant, the Deputy Commissioner of Commerce’s Energy Resources Division. An afternoon panel discussion highlighted the work of the Achievement Award winning communities. More information about the awards and the 2018 recipients is available at the Commerce Department’s website. 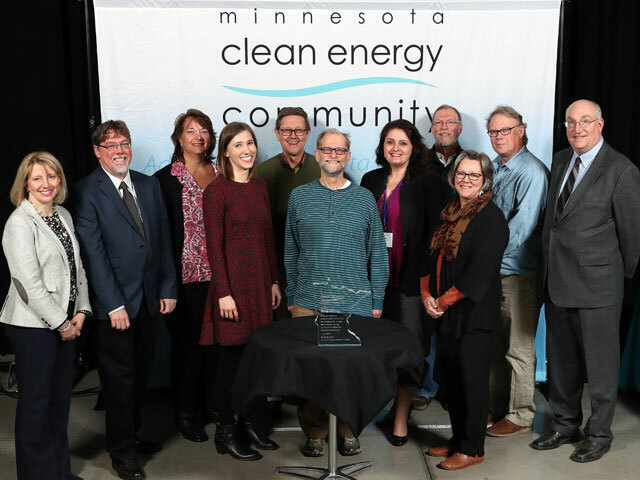 Project: Green Wing Energy Action Plan – The City of Red Wing teamed up with Xcel Energy to develop the “Green Wing Energy Action Plan” to help residents and business owners save energy while promoting renewable energy. Project: Solar Capital of the Continental USA – The Town of Crystal Bay (Finland Community) adopted a comprehensive land use plan that includes energy conservation and alternative energy production as one of its goals for community development and sustainability. Project: Moving Winona County Forward: A Rural Energy Collaboration – Members of the Sustain Winona Coalition and Winona’s Energy Action Team have increased community-wide adoption of energy efficiency and conservation by bringing together community partners across Winona County as part of the Moving Winona County Forward energy collaboration. 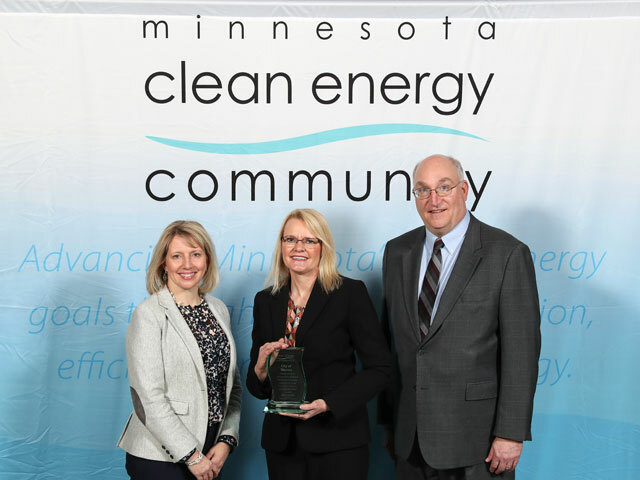 Project: Edina’s Electricity Action Plan – In 2017, Edina’s Energy & Environment Commission, city staff, the Center for Energy and Environment and Xcel Energy collaborated to create an Electricity Action Plan and execute multiple strategies to meet four goals around energy efficiency and renewable energy. Project: Hennepin County Building Energy Benchmarking Collaborative – Hennepin County has planned a program that will provide technical resources for small to mid-sized cities to implement energy benchmarking programs. Project: City Benchmarking Initiative – The City of Warren has begun the development of an automated benchmarking program that will initially track utility usage of its buildings in B3 Benchmarking, with the potential to expand to private commercial buildings and residential households. Project: Campus-Wide Energy Savings—Sustainability Project – Minnesota State University-Mankato awarded an $8.1 million Energy Savings Performance Contract for 31 campus buildings and various parking lots, sidewalks and roadways on campus. This project will help the University save more than $404,000 annually in energy and avoided operational and maintenance costs over 18 years. Click here to download presentations form the Achievement Award winners that they gave during the CERTs Conference. See winners from the previous round of awards in 2016!